As the nation—and even the world—approaches yet another Rev./Dr. Martin Luther King, Jr. holiday, some will be reflecting on how far we’ve come since King’s time. Others will be calling for renewed vigor toward activism and social justice, noting how far we still have to go toward King’s “dream.” Last year I was one of those voices. This year, however, I am instead overwhelmed by tremendous grief. The racism King deplored and gave his very life to combat simply will not leave us. It seems no sooner can I experience the joy of connecting to another person than it is cut short by the cold hard truth of what racism does to relationships, and to our inner beings. And just as I am grieving personal loss, I too am grieving the loss for all of humanity. That too many of the human species are condemned to lives far dimmer than what the bright light of their spirit could hold, if it weren’t for the invention of race and its rules of division. One analyst who shares my grief is Ta-nehisi Coates. I was deeply moved this summer after reading his new book Between the World and Me. After noticing some reviewers accuse Coates of overgeneralizing about whites and/or police officers (see here for example) I knew I had to get a copy to read for myself. I’m all too familiar with my students and others reading things that aren’t there when it comes to racism. Not surprisingly, I found Coates was not the mythical creature he was purported to be. (You know, the one that hates all white people and won’t give even them a chance–e.g., like the black person “who took your job,” or the “close” black friend you have). However, we still have yet to have a documented/verified sighting of such a black person! These very fences are directly responsible for many of the losses I am grieving. I connected so deeply to Coates’ writing because he wrote as a parent torn between the beauty of a child who believes he can dwell above the veil, beyond the veil (see W.E.B. Du Bois), and the harsh reality that one’s job as a parent is to protect one’s children of color from being slaughtered by these fences—-all the while knowing in the end we will have little to no control when the unfairness of it all crashes down onto them. I am the one they look to, to tell them they can be anything they want to be when no one else will, but as a person who values honesty, I cannot lie to them. And as a parent who wants them to succeed, thrive, and prosper, I cannot ill-equip them by shielding them from these truths. This need to be always on guard was an unmeasured expenditure of energy, the slow siphoning of the essence. It contributed to the fast breakdown of our bodies. So I feared not just the violence of this world but the rules designed to protect you from it, the rules that would have you to contort your body to address the block, and contort again to be taken seriously by colleagues, and contort again so as not to give the police a reason. . . .This is how we lose our softness. This is how they steal our right to smile. . . It struck me that perhaps the defining feature of being drafted into the black race was the inescapable robbery of time, because moments we spent readying the mask, or readying ourselves to accept half as much, could not be recovered.(pp. 90-1). These many costs of racism that take grave tolls on black bodies and minds have been documented empirically in Joe Feagin and Karyn McKinney’s book, The Many Costs of Racism — high rates of hypertension, workplace-induced carcinogens (i.e., much environmental racism), and other factors all ultimately resulting in lower life expectancies. Thus, one piece of my grief, for example, is that my children will never know their African American grandmother, who died at only 52, and was one of the most hardworking, loving, giving, caring, and musically talented members of the family. Yet many African Americans might only dream that their children had been able to see the age of 52—instead, their children, such as (most recently) Prince Jones, Michael Brown, Trayvon Brown, Tamir Rice, and far too many others must be mourned before they can even be parents themselves, much less barely finish their childhood. Coates wrote Between the World and Me in the form of a letter to his son, who cried in his room inconsolably after learning of the Michael Brown verdict. Coates knew that telling his son everything’s going to be all right was not an option. After the book’s printing, no doubt Coates would not be surprised there would be no justice for Tamir Rice either. Racism literally takes away life, which is bad enough. But for those of us who remain, while we remain, racism does damage to our lives as well. So I am grieving today that I had to have “the talk” with my 8-year old black son. Much as I wanted to put it off longer–the child still believes in Santa Claus–a well-meaning white family member forced my hand, by giving him the toy gun he asked for for Christmas. I had to tell him that a police officer might shoot and kill him with the justification that he thought he was holding a real gun. Lest his naïve white mother be talking about something she was clueless about, he turned to his older sister for some sort of confirmation or denial. When his sister–with hair like his and skin like his–told him, “yes, it’s true,” at that moment he knew that all the nice refrains in school about the police officer being his friend were but one version of the real story. I am grieving that “the talk”–that was once associated with getting one’s driver’s license and becoming a young man–is now a talk for little ones who still take their steps down a staircase two feet at a time. And while I shoulder this, I am also grieving a three-year relationship with the beautiful African American man I thought was my soul mate. Though each of us was raising children of our own, it was mentioned that my parenting was perhaps too optimistic. “We did not choose our fences” (Coates 2015:42), but those fences inevitably mean we only could connect but so much, and but for so long. Imagine how much more energy one could devote to strengthening one’s relationships if one’s body were not constantly drafted into the war of fighting racism. Perhaps fortuitously, a skilled and talented DJ chose “Footprints” as part of the soundtrack to our first date. It begins with a mother saying a routine “hurry back” goodbye to her son, only to lose him forever in a shooting—-much akin to the grief Coates chronicles in his interview with the mother of Prince Jones. Those who subscribe to the “dream” are usually ignorant of the fact that racism in the form of slavery and Jim Crow forms fully 83 percent of our nation’s history so it’s foundational and ongoing, as opposed to a temporary hiccup. When Michelle Alexander reviewed Coates’ book for The New York Times review of books, she read it twice–the first time she was so disheartened that he offered no optimistic, visionary, inspirational vision for the future, that she had to read it again a second time with new adjusted expectations. Coates does not provide a way out of the mess. And although I do not share Coates’ atheism/agnosticism, what lover of justice among us has not questioned why a benevolent God would allow the ugliness of racism to continue to rage with no end in sight? My wish for you is that you feel no need to constrict yourself to make other people comfortable. None of that can change the math anyway. I never wanted you to be twice as good as them, so much as I have always wanted you to attack every day of your brief bright life in struggle. The people who must believe they are white can never be your measuring stick. I would not have you descend into your own dream. I would have you be a conscious citizen of this terrible and beautiful world” (pp. 107-8). If one listens closely, there are moments of beauty of this world Coates celebrates throughout these pages. Those are the moments when one dwells outside the veil, when the fences have been temporarily lifted, when the softness dares to emerge despite the inevitable risk of pain that looms just behind. Coates eloquently shares with the reader the moments when he is bowled over by the bold no-holds-barred confidence of his son or his wife, or the way his fellow students groove to the music at a party. They exude a soulfulness and a zeal for life that he cherishes in those moments. Those snapshots in time become all the more beautiful when you are fully conscious of how rare they are, and how inevitably they will be interrupted. In a bereavement workshop after the passing of my father, I was reminded that grief is an indicator of once having loved and being loved in return. Toward the end of his life, this man sent me a card every year on MLK day to acknowledge and honor my work. He would also remind me of the Buddhist teaching on impermanence–everything, whether wondrous or painful, too shall pass. 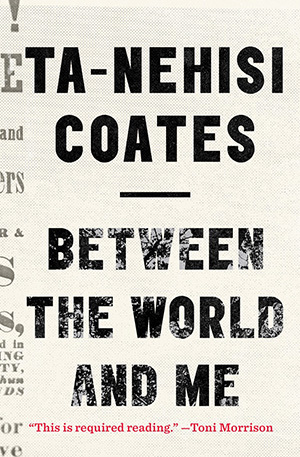 Coates brings us face to face with the kind of pain that is like fire or looking into the son-—at some point, many readers feel compelled to put the book down and look away, it is too heavy to bear. Yet, even though he is a skeptic, he is fully conscious. His eyes are wide open, and he does not want to miss a moment. So on this Dr. Martin Luther King, Jr. Day, while the national focus on race and racism only calls to mind the sadness and pain it inflicts upon my relationships with those I love most, I am also challenged to follow Coates’ lead: as I grieve, I will keep conscious. I will cherish the moments my love and I got lost in the music and there were no fences between us. I will cherish the moments my children played with abandon without a care to how boisterous they were, and no one was there to invoke our fear of sanctions that might befall them when their “race” trumped their youthful innocence in someone’s eyes. Most of all I will keep telling the truth, and I will not keep silent, about the racism that keeps us all from being able to enjoy so many more of those moments with each other. ~ Eileen O’Brien is Associate Professor of Sociology and Assistant Chair of Social Sciences at Saint Leo University (Virginia campus). She is currently researching race and hip hop (with Nosh McTaggart) and race/gender in military families (with Stephanie Byrd). Her books include The Racial Middle, and Race Ethnicity Gender and Class (with Joseph Healey).